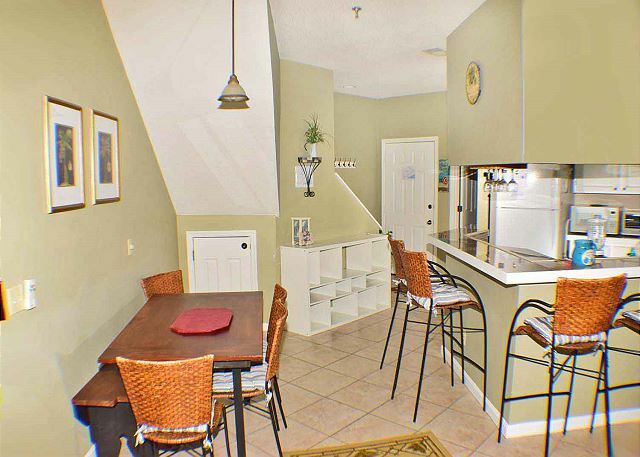 Charming 3 bedroom Townhouse - 2 levels with Kitchen, Dining, and Living Room on the main level. 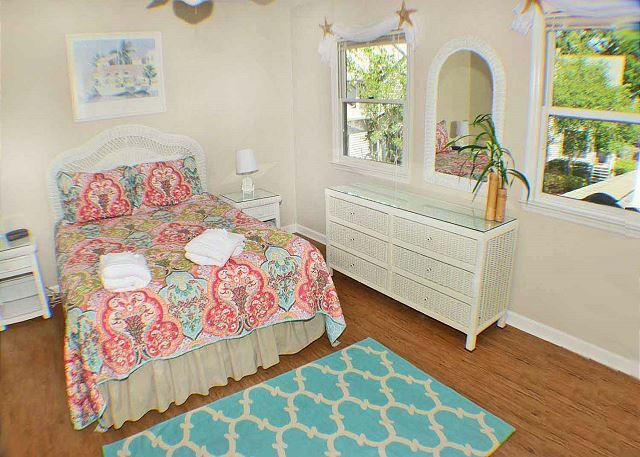 Large Master suite on the ground floor. 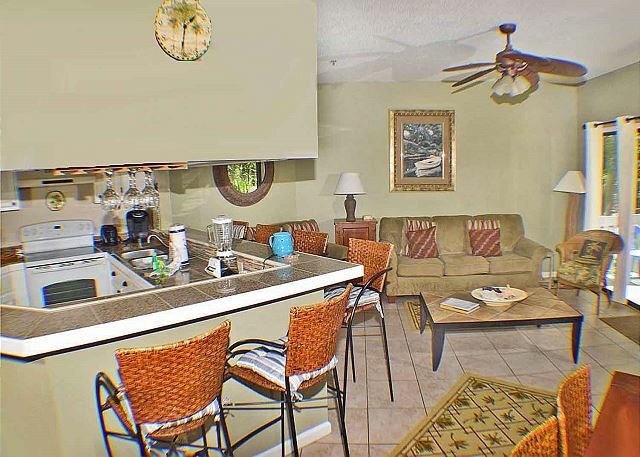 This hidden gem is just a short walk to the beach and 50 yards to the on-site pool. 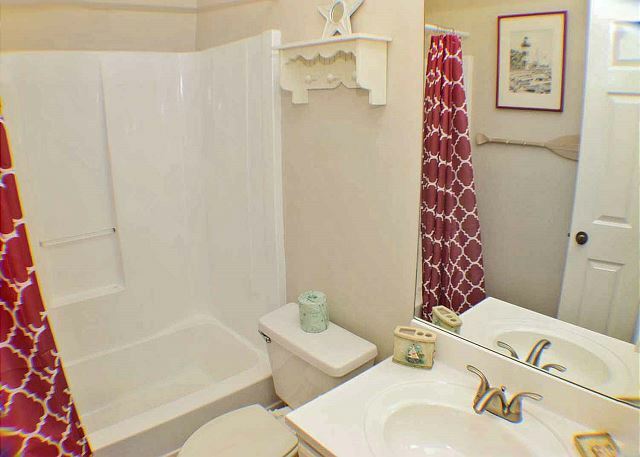 Second Floor features 2 more bedrooms, with 2 more private baths. Queen in Lower Master, Queen in Upper Master, Twins in 3rd Bedroom. Lots of Windows create the feel of light and airy rooms. 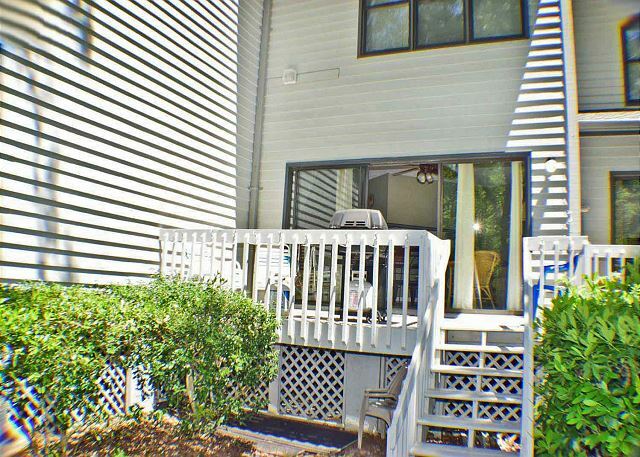 Private back porch has a secluded tree line deck with a grill. 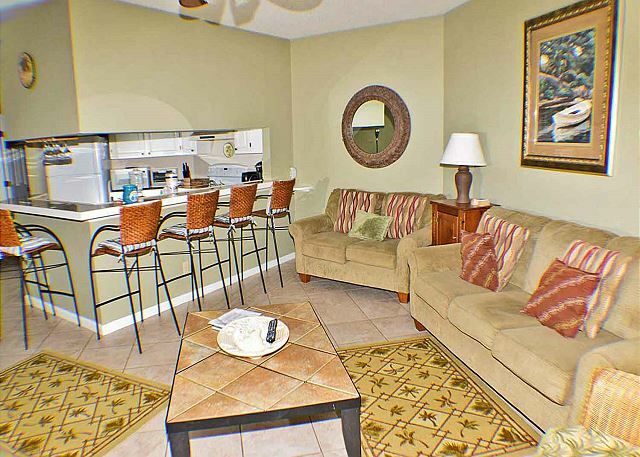 Ocean Breeze is dog friendly and accepts your furry best friend. You and your dog will enjoy miles of bike paths and sandy beaches to spend your sunny days walking all over the island. The Forest Beach area is packed with activities. 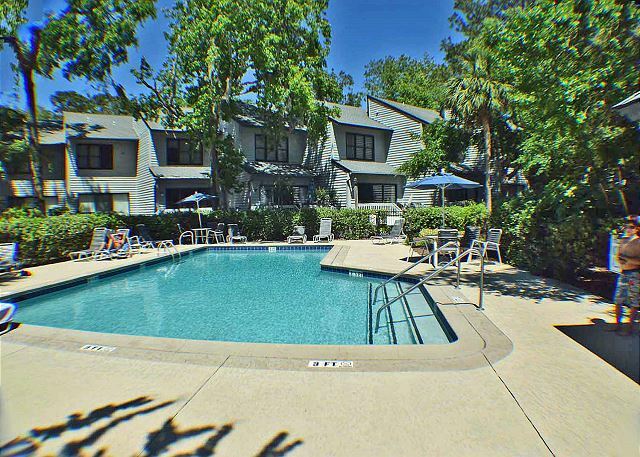 This complex at Ocean Breeze is further down the beach and more secluded from the hustle and bustle of Coligny but close enough that you can still enjoy all of the amenities. Very happy to find a rental that accepts pet without an huge pet deposit. Beds were a little uncomfortable, too firm and carpets on steps needed to be cleaned (steam or other). The air conditioner went out the second day, but the office was very responsive and had someone there within an hour (clogged condensation drain). Excellent Location. Condo was perfect for our family of 5. 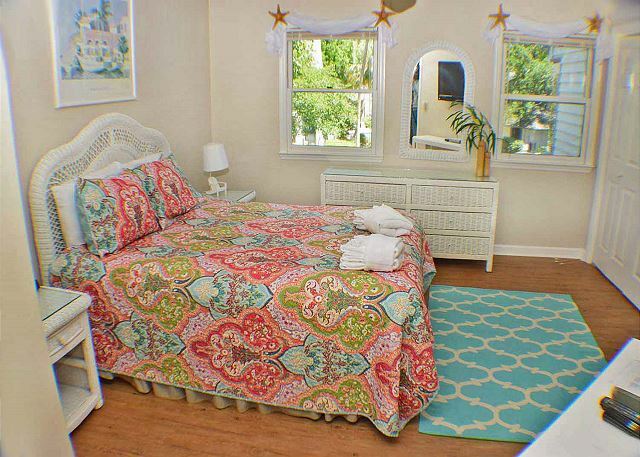 While it does say sleeps 8, it would be super tight if everyone was in living space at once. Kitchen was very well stocked. Quick walk to beach. Unit could use some updating. For some reason, after 10, there was almost no hot water. Unit was clean. We had issues getting into our unit, but a call to emergency line got us a new code. Directions to find unit were confusing. Would stay here again. 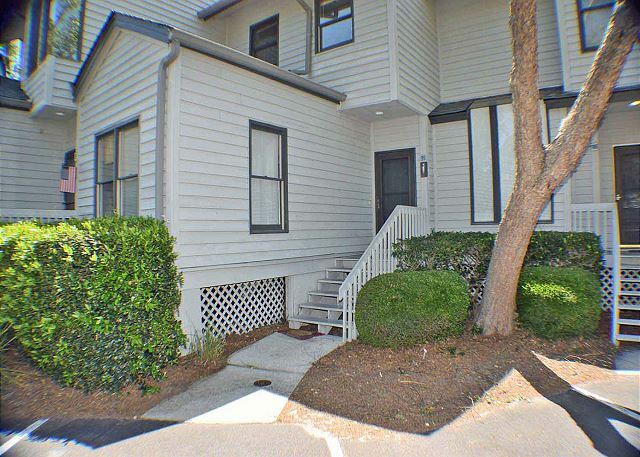 We love HHI for it's laid back, dog loving atmosphere and Ocean Breeze properties are in a great location near the beach. I would rate this rental property 5 stars but for a couple of things: 1) The very, very bright porch and complex outside lights. They shone through the curtains of the bedrooms like a beacon. Optional black out curtains might be a good thing. 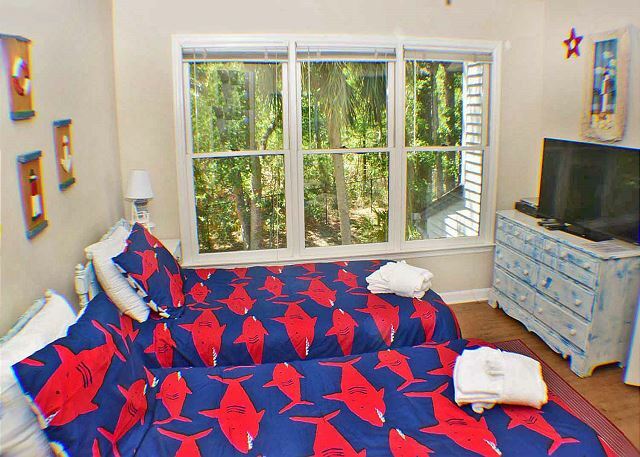 2)As with many rentals the bedroom mattresses were a bit long in the tooth; as well as the couches in the living room. 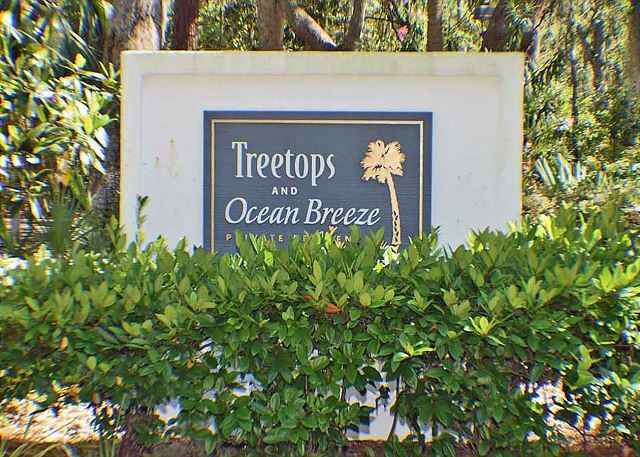 Ocean breeze 99 was the perfect vacation property for our family. 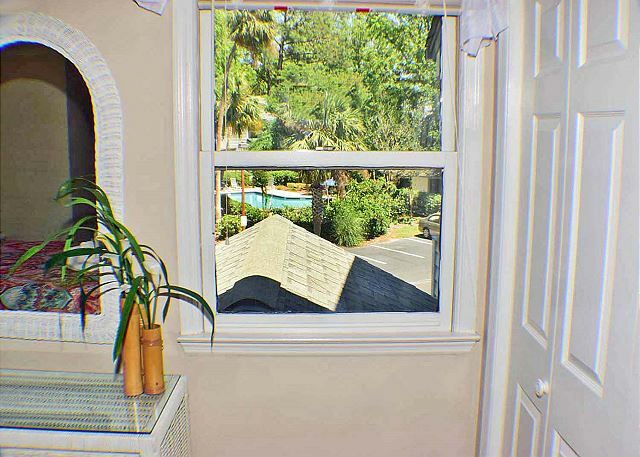 The house was in an excellent location less than a 10 minute walk to the beach and about 20 minute walk to Coligny plaza. 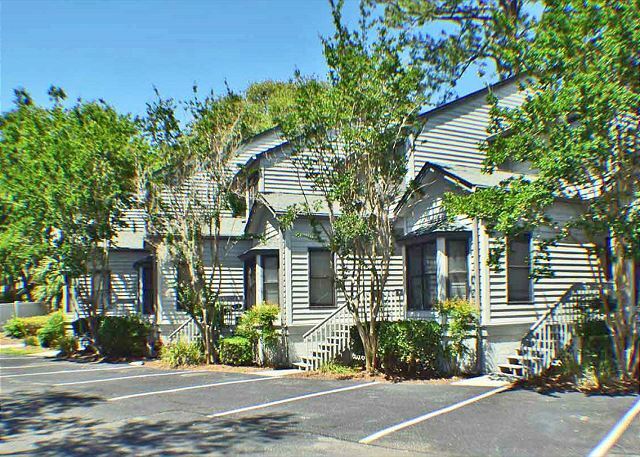 we had an amazing time in Hilton Head and would definitely rent this property again if and when we go back. We love this condo. 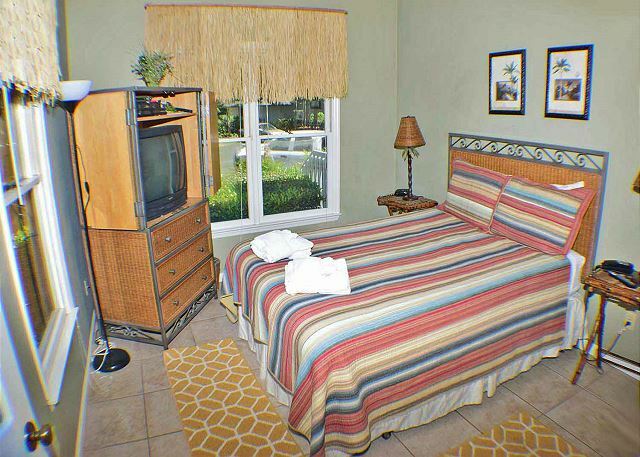 Beautiful, comfortable, and pet friendly so we can include our four-legged family members. This is the third time we have stayed at 99 Ocean Breeze. We plan on staying there again next year. Love the island and all it offers for a relaxing vacation. We have vacationed on the island for the last 33 years and we never tire of it. We have made a lot of family memories. 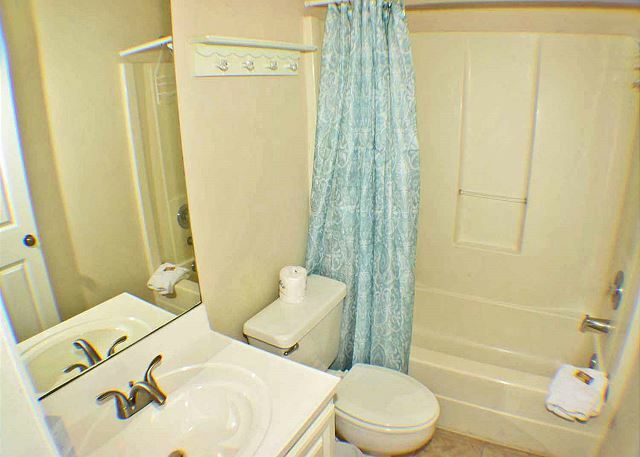 Overall the property was very nice; however the windows are extremely thin. The layout worked well for our family and we had everything necessary for our weeks stay. My only complaint is the carpet on the stairway. It was not vacuumed well at all upon our arrival. It needs to be steam cleaned at least being pet friendly. 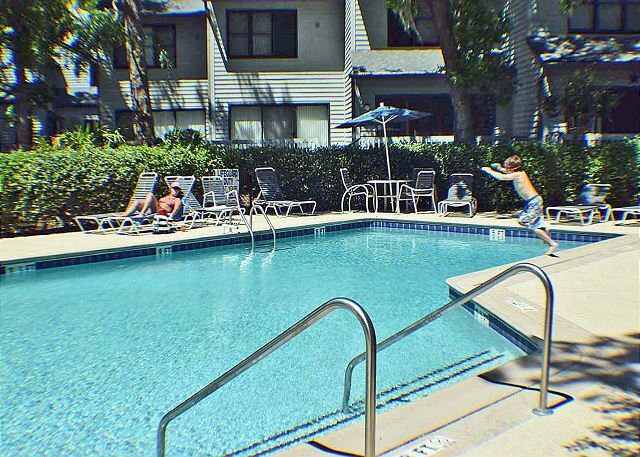 We stayed in this condo in June 2018. One reason we chose it was due to the owner's allowing us to bring along our (large) dog. The condo was a good fit for the dog; the first floor is entirely tile floors and made cleanup of sand and other debris pretty easy. The entire condo was very clean. 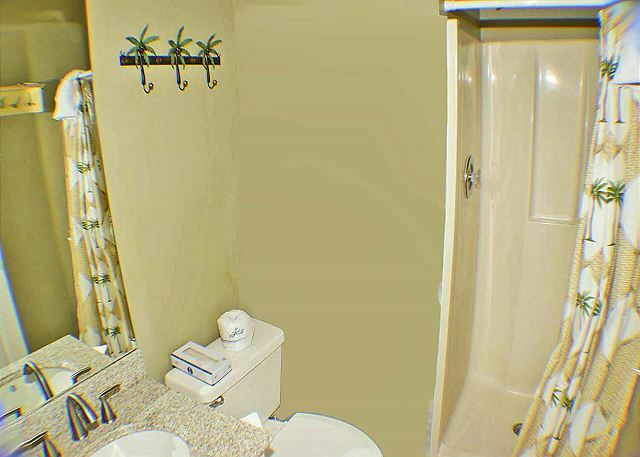 Each bedroom had a private bathroom; the first floor bathroom was more open to other guests, but there was a door to the hallway we could shut so that was fine. 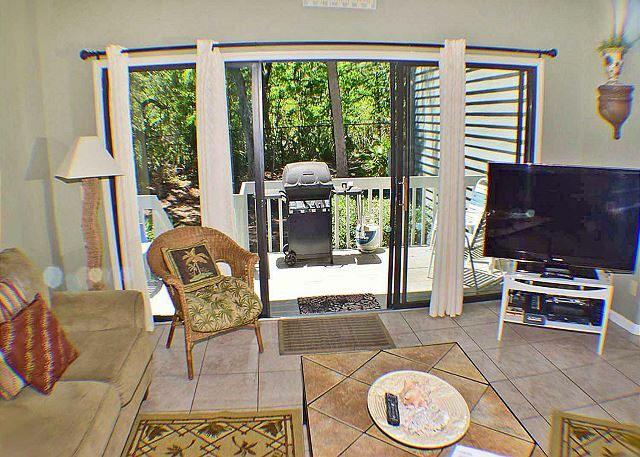 The condo has a small back deck with a grill. We did grill one night; it could use some cleaning and was a little scary, ha ha. 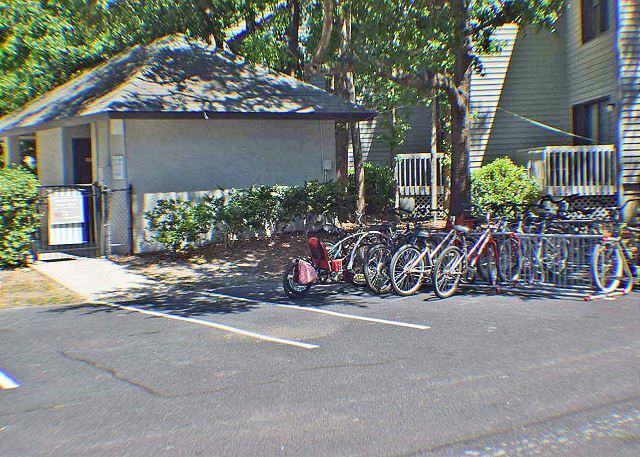 The condo is 1/2 mile from the beach, so bringing or renting a bike is highly recommended. Most of the path to the beach is along a trail that is away from the road, which was nice. 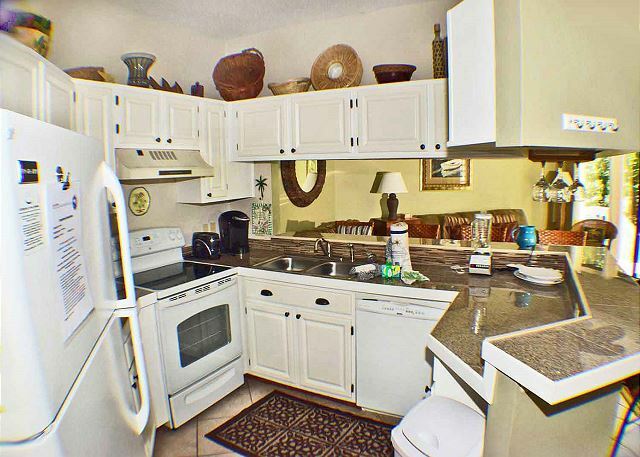 The one drawback to the condo is the homeowner's association management (not Seashore Rentals). Talk about picky! They threatened to tow our cars since we didn't have tags (we were never informed about the tags). They posted rules on our front door about not leaving a towel outside on the railings to dry out. And then the condo association didn't even have recycling, which is a personal pet peeve. So, be aware of these things. It was pretty annoying because, after all, we were there to relax, not have to deal with petty nonsense. By the way, Seashore Rentals was very helpful is getting us "compliant" with parking passes. Their staff was very friendly. Great townhouse. Very quite area. 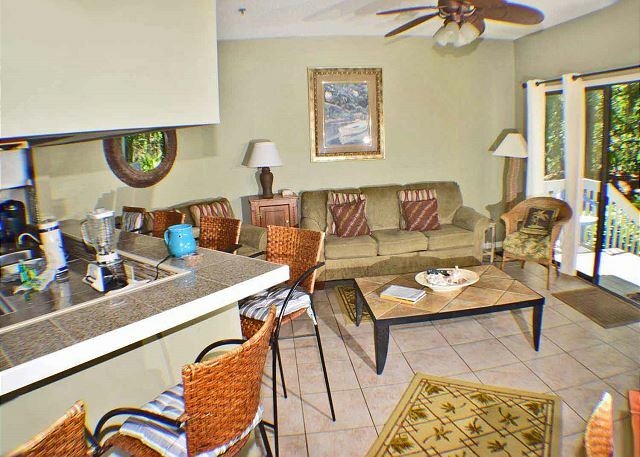 Easy walk to the beach with easy access and public parking near the public access. Close to everything that we needed or wanted. Will book again if available for next trip to Hilton Head Island. Really nice setup for my family! 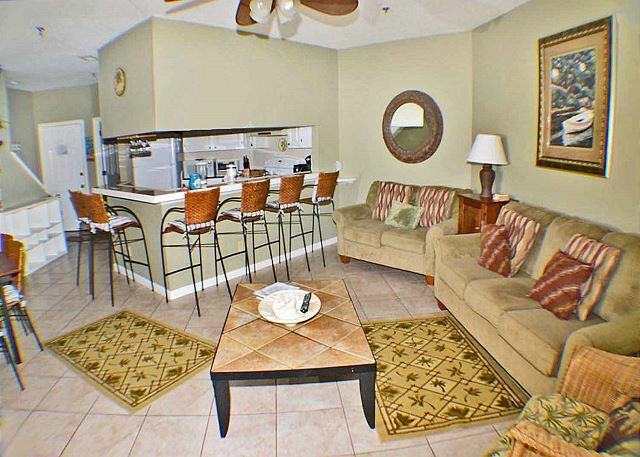 First condo rental (usually do a house but we were a small group this year) - very comfortable floor plan. Found everything we needed - the place was really clean. Location was great $7 uber from Coligny Sq on Saturday night. 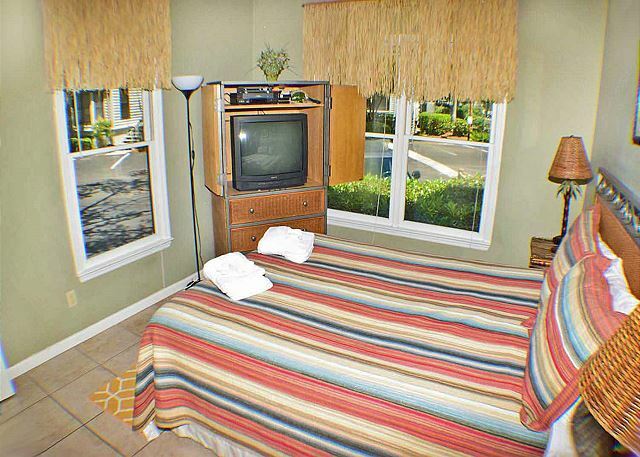 I will hopefully rent the same unit next year. Thank you so much for sharing this lovely home , it met all of our family needs and more. The location was perfect! We will be certain to look to renting here again.